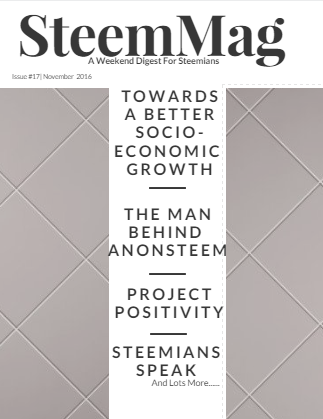 I’m delighted to welcome you guys to the seventeenth edition of SteemMag, a weekend digest for Steemians. This Week has been a pretty eventful one on Steemit. It started with the continuous loss on the price of Steem and SBD and its ending with a rise. One only seen during the post-July days. Perhaps the most important post of the week was that @steemitblog’s yesterday post outlining a number of proposals aimed towards revamping the state of the Steem Economy. SteemMag reached out to @good-karma – a Steem App Developer and a witness. He has not only created the first Steemit Mobile App but has also developed a number of apps including one exclusively for the oncoming SteemFest. I also reached out to @timcliff – a witness and an avid commenter to ask his opinions on the recent proposals by Steemit Inc.
SteemMag had a chat with @lifeisawesome- an amazing writer and the lead behind Project Positivity. I also reached out to @someguy123 – a witness and Steem Tool Developer. How has it been so far being a steem-based developer? And what inspired you to start creating apps for the steem blockchain? After being involved with community early in July, I quickly realized that there is no mobile applications at a time, built on top of Steem. And I thought why not create one and since I was already working as an independent contractor for building mobile apps and web apps, this looked like a chance to work on something new and cryptocurrency related. It was exciting to see reaction of the users when I posted first ANN post. Right there I knew I was going to work full time on this and slowly terminated my contracts and started working full time on Steem based applications. You can already see the results of that with eSteem, Steem Monitor, SteemFest applications and honored to inspire number of people in community to kick-start/make mobile applications, that's awesome! Steem makes it easy to access all the data from blockchain by providing ease of use API and I encourage all developers out there to give it a try and start building! How has it been developing the only functional mobile Steem app? Challenges so far? eSteem - mobile app and soon desktop app, development is going great, community very actively giving feedback, supporting, requesting new features. Roadmap for the app is clear and next few months will be very exciting experience. Another challenge is, funding, being concentrated on projects you lose track of funding and recently it came to the point that project expenses grow with image hosting in-app and running servers etc. But I hope we will figure out those things in due time, that's one of the reason recently started to focus on how can we make applications self sustaining so that project expenses can be covered. Thank you for those who are supporting with voting my posts and witness. In either case, I'm happy with how far we came with mobile app development and all of these projects are open-source and community can easily pick up and continue development even if I'm not there or start contributing and joining the forces, although I will continue working and bring app to production ready stage in next few month. What has been the most fascinating aspect of helping in preparation for SteemFest especially in relation to the app? SteemFest is one of those events that you will remember for your lifetime and you shouldn't miss it if you are able to come. Right after, Roeland made announcement and talked about event via private chats, I supported the event, thought it is great idea and wanted to help him out in any ways I can, just like hundreds of community members are doing. And asked him if it is good idea to make a mobile application for the event, he loved the idea and we started working on SteemFest app with @cass as designer. What an amazing experience it is. This venture working with Roeland to test and fix, fiddle around in early stages, try different things was fascinating, it is nice to see community coming together, working together, making new friends. When we finally were ready to push releases to AppStore and Google Play, we got review and release with 6 hours, wow that's one of the quickest review I had during my mobile app releases to Apple AppStore. What features and solutions are you looking forward to on Steemit and the Steem Blockchain? Earlier in witness interview I mentioned that we all are learning a lot during beta stage and by this experience and community feedback Steem and Steemit, eSteem and other applications on top of Steem finding various solutions to what community needs/wants and we certainly come to the point where we will have whole economy and marketplace for Steem and its users. And I will be happy to know that I have contributed to that future a tiny bit! What's your opinion on the recent changes proposed by Steemit Inc? A lot of comments were made on the proposals post. So I thought it would be awesome to get the opinions of a number of Steemians on the new proposals.. I was one of the people that before the recent changes were proposed were arguing in favor of the current inflationary model. I think that the largest issue was a lack of understanding, rather than an actual problem, and most people were thinking it was bad because they didn't really understand how it worked. The fact that the price of STEEM has fallen a ton since the July spike, and had started to reach new lows was basically giving people a lot of reason to think they were right. They are basically saying: see - the price is going down. This is proof that the current model doesn't work. I got in a very long discussion with one of the users that was arguing against the inflation (@snowflake), and I basically said at the time that it would be very difficult to know which of the two ways was better. It could be the case that getting rid of the inflation could make the situation better than it is today, but the change in "property rights" also has a large cost as far as introducing instability, and lack of faith for investors that things won't just keep changing. My main reason for keeping the inflationary model wasn't as much that I thought it was "better", but more that I thought changing things around carried a significant cost. I wrote a post the other day that talked about how the value of a 'vest', which is basically a share of Steem Power, has actually still gone up slightly when looked at over the long term: https://steemit.com/technical-analysis/@timcliff/historical-mvest-to-usd-price-chart-steem-power-has-not-lost-value-over-the-long-term. A lot of the "sky is falling" talk is because people are comparing the price of STEEM with it's peak, rather than the value of a SP vest over the long term. I think more people should be focusing on the value of a 'vest' over the long term, because as investors - that is really where our value comes from. With that said though, sometimes the perception of a problem can sometimes be as bad as an actual problem. The lack of understanding and panic was causing people to lose trust in the value of STEEM/SBD, which was making the situation worse. There was a lot of unhappiness in the community, as well as lack of faith/trust in the leadership to turn things around. I think the fact that they decided to change shows that they really care about what the community thinks - which in my opinion is a huge plus. Changing the perception is probably going to do a lot more for the value of STEEM/SBD/SP than the actual change itself. Regarding the change in SP holding time from 2 years to 3 months I think is going to be a big improvement in the long term. The 2 year lock-in period I believe was preventing a lot of potential investors from investing. My biggest worry is that in the short term it has the potential to cause a price crash, but I think in the long term it will definitely be good. As a backup witness, I am happy that the backup witnesses will be getting a larger share of the rewards. Many backup witnesses are actually running their servers and operations at a loss, so I think this will help to compensate a part of the community that is adding a lot of value. I also think it will provide an incentive for more people to try becoming a witness - which adds more quality to the witness pool (which is a good thing). For the top 19 witnesses, I was really disappointed to see the community's lack of understanding in how vital of a role many of these people play. I know it seems like they are making a ridiculous amount of money, but in reality most of them are funneling it back into the community in various ways. Similar to what I said before though, sometimes the perception of a problem can be as bad as an actual problem - so if it is going to help the overall community accept what the witnesses are doing and getting paid - then in the long-term it will probably be good. It is going to be an adjustment though for many of the projects that the community is used to having. The leadership/witnesses are going to have to find alternative ways to fund a lot of the things that have been getting paid out of witness compensation. I'm not sure yet where that funding will come from. I also think the change of SBD conversions from 7 days to 3 days is really good. Overall I am very happy that Steemit, Inc. decided to make these changes. I think that they are taking the project and community in the right direction for the future. Most importantly though, I think that it demonstrates without a doubt that the people steering the ship are listening to what the community has to say, and that they really do have the project's best interest at heart. Thanks @timcliff for participating in this weekend’s Steemians Speak feature. Very Interesting! Thanks so much for sharing!